This vintage poster from 1965 advertises the Spacemobile — a traveling educational outreach program sponsored partly by NASA. The poster is part of the series "Propoganda Posters Distributed in Asia, Latin America and the Middle East, ca. 1950 – ca. 1965," in the U.S. National Archives. The poster was featured last Thursday (Feb. 26) on the National Archives "Today's Document" website. It's a blast from the space-age past: A poster from 1965, featuring a space explorer traversing a distant world, was unearthed from the National Archives and posted online on Feb. 26. The awesomely retro print is dated Feb. 26, 1965, and it captures the aesthetic of space-based art at the time — it looks as if it could be the cover of a 1960's science fiction novel. The poster is advertising NASA's traveling space-education program "the Spacemobile." These mobile outreach units would travel to schools and events to tell students and members of the public about space sciences and the work being done by NASA. The Spacemobile program was active in the U.S. in the 1960s — the decade when America was embroiled in a race with Russia to send people into space and to the moon. In 1965, Edward H. White II became the first American to perform a spacewalk. And in 1969, Apollo 11 became the first lunar landing mission to put humans (Neil A. Armstrong, Edwin E. Aldrin and Michael Collins) on the surface of the moon. 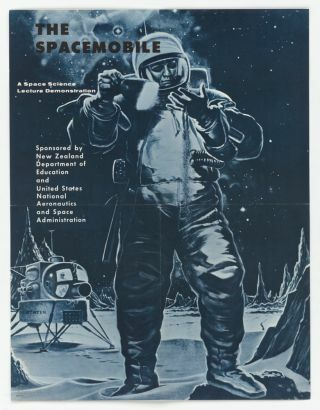 This particular poster is advertising the arrival of the Spacemobile in New Zealand, jointly sponsored by the New Zealand Department of Education and NASA. The National Archives put the poster in a series titled, "Propaganda Posters Distributed in Asia, Latin America and the Middle East, ca. 1950 – ca. 1965." Earlier this year, we wrote about a new series of NASA posters with a retro feel, advertising tourism to planets outside our solar system. But the Spacemobile poster is the real deal: a genuine artifact of NASA advertising in the 1960s.